Phil Hine remembers the occult ‘zine (only 93p!) that set the scene for the modern magician in the ’70s and ’80s, and also heralded a new era of persecution – this time trial by media – for British witches. From the first issue of the LOT, there was a regular contributor writing about various aspects of Witchcraft under the pen name of “Galadriel”. Galadriel’s first article basically pointed out that for the most part, “modern wicthcraft” was mostly made up – but that there was a hereditary tradition of which Galadrial was an iniitate. This article drew counter-responses from both Raymond Buckland and Alex Sanders. Undeterred, Galadriel followed through with an article in issue 3 of LOT claiming that those of the “hereditary clans” do advocate cursing enemies, and even more controversially in issue 4, with the claim that Galadriel’s clan practice both animal sacrifice (at feast times) and human sacrifice (actually a ritual form of voluntary suicide). This was strong stuff, particularly when you consider that this was 1981. Read more over at Phil’s excellent Enfolding blog. 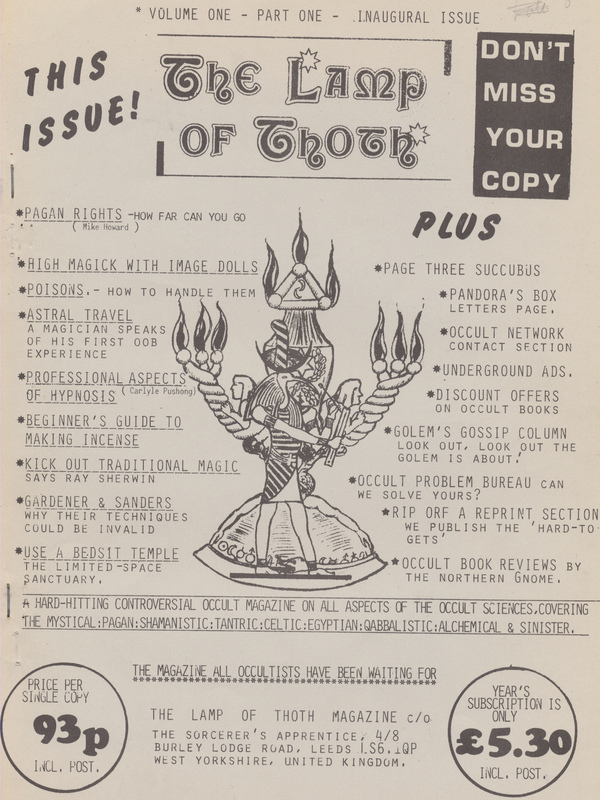 There are also PDF archives of Lamp of Thoth – ‘the only occult magazine that tells it like it really is’ – available to buy here.